This page is SPOILER HEAVY. You can toggle spoilers with the 'Spoilers' tab at the top of each page. Hidden text can also be revealed by highlighting it. Okay. Look. We both said a lot of things that you're going to regret. But I think we can put our differences behind us. For science. You monster. Portal 2 is the sequel to the award winning and hugely successful Portal developed by Valve Corporation. It features a single-player story set after the events of Portal's story; and a brand-new Co-op game mode, featuring additional test chambers designed specifically for Co-operative play. Portal 2 was released April 19, 2011 on the Steam platform. Retail release in North America started on April 19, 2011; and later, Europe and Australia on April 21, 2011. Portal 2 takes place an indeterminate amount of time, somewhere between 50 and 50,000 years, after the events of Portal, which saw Chell destroying the sentient computer GLaDOS, and landing outside the facility, only to be dragged back inside of Aperture Science where she was ultimately placed in a Relaxation Chamber by Doug Rattmann for the indefinite future. After considerable time has passed, Wheatley, a personality core, that has helped to maintain Aperture Science during the absence of GLaDOS arrives at the room of the awakening Chell. With a desire to flee the crumbling facility, Wheatley and Chell begin their quest to escape Aperture Science to return to the real world. After separating from Wheatley and completing a series of tests revisited from Portal, Chell reunites with Wheatley and head to what they believe will be escape. They must cross through the chamber of GLaDOS who lies broken and dismembered on the floor of her chamber, they enter the breaker room looking for a way out, and instead accidentally reactivate GLaDOS. They rise up through the floor just in time to witness GLaDOS pulling herself back together and taking over the facility again. Chell and GLaDOS quickly reunite, culminating with GLaDOS using a robotic arm to drop Chell into the incinerator, and guiding her back towards a new series of tests that GLaDOS intends to force Chell to run continuously until she dies. Meanwhile, Wheatley attempts to find a way to get out from under GLaDOS and continue their attempt to escape facility, with Chell's help, he intends to disable her turret production line, disable her Deadly Neurotoxin and then shut her down once again to facilitate their escape. He reunites with Chell and they escape through the bowels of the building. After achieving their goals and enter GLaDOS' now rebuilt chamber, the computer system detects an alternate core and begins the process of a core transfer, which GLaDOS promptly refuses, prompting the Stalemate Button to be activated. Chell works her way to the button, finally hitting it, which then swaps out the cores of GLaDOS and Wheatley. Wheatley, corrupt with the power from the entire facility of Aperture, quickly turns on Chell, and shoves GLaDOS into a potato battery as revenge. He knocks them down an elevator shaft where they fall to the remnants of the previous incarnation of the Aperture facility. GLaDOS (in potato form), has now informed Chell that Wheatley was designed to make extremely poor decisions, in order to turn GLaDOS into somewhat of a moron in an effort to control and dampen her homicidal tendencies. She informs Chell that Wheatley's lack of stability is going to cause the destruction of Aperture Science killing everyone and everything inside the facility. Before Chell can decide whether or not to help, GLaDOS is swooped away by a bird and Chell heads off to attempt to find a way back into the primary facility. Chell uncovers the remnants of a 1950's Aperture Science guided by the voice of the now deceased Aperture Science founder Cave Johnson. She enters a series of tests, often having to navigate between them in unconventional ways due to the deterioration of the lower facility. At this time we learn of Cave Johnson's secretary/assistant, Caroline, of which Cave is rather fond. Chell reunites with GLaDOS in the nest of the bird that took her. GLaDOS, insistent that she can't lie with only 1.1 volts of power, implores Chell to take her with her to put her back in her body and stop Wheatley from destroying the facility. Chell ultimately agrees and attaches GLaDOS to her Aperture Science Handheld Portal Device and they continue to try to find a path towards the upper facility. As Chell continues to run through tests from the 1970's, and 1980's, GLaDOS becomes curious about Caroline and Cave who she keeps hearing in the recorded guidance in test chambers. She comes to a realization, that she chooses not to share with Chell, and they head towards the newer Aperture facility. In an effort to get back up, Chell must turn on pump stations Alpha, Beta, and Gamma which connect Repulsion Gel, Propulsion Gel, and Conversion Gel to the newer facility. Repulsion and Propulsion Gels were Apertures attempt at a dietary supplement, whereas Conversion Gel, made from crushed up moon rocks which ultimately lead to the death of Cave Johnson, is used as an ideal portal conductor. When painted on any surface, the ASHPD can be used as designed. They reach the newer facility where Wheatley has taken full control. Wheatley, now in the body of GLaDOS which has a built in euphoric response to testing, forces Chell to begin a series of tests to fill Wheatley's new found insatiability for testing. These begin with a rather weak attempt by Wheatley to create a test chamber, but ultimately lead to test chambers stock piled by GLaDOS and shoved together crudely by Wheatley. Chell passes through these chambers, and once again finds her way out of the control of Wheatley and into the bowels of the facility. They arrive at Wheatley's test chamber which, he says, has been designed with the entire purpose of not allowing Chell to defeat him. Chell causes Wheatley to destroy a pipe containing Conversion Gel, allowing portals to be used in the chamber which ultimately leads to his destruction. With help from GLaDOS, Chell attaches corrupt personality cores to Wheatley. Once the cores are attached to Wheatley, he becomes corrupt, initiating another core transfer. However, in one of the most intelligent premeditated moves Wheatley performs, he has booby trapped the stalemate button, launching Chell back into the chamber, a single portal laying under Wheatley's hanging body. Alive despite the explosion, Chell reaches for her Portal gun, and, remembering that moon dust creates an ideal portal surface, aims it through a hole in the ceiling at a full moon high in the sky. She fires, causing the space core, the adventure core, Chell, and Wheatley still attached to GLaDOS' body flying into space. GLaDOS quickly regains control of her body, knocks Wheatley into space, and pulls Chell back into the facility. GLaDOS monologues regarding no longer having the desire to kill Chell, and instead just wants her to leave the facility forever. She sends Chell up an elevator, past a chorus of turrets singing an opera directly to Chell, and out into a wheat field. Moments later the Companion Cube, burnt and beaten, is thrown up after her and lands on the ground next to Chell. Now in space, a remorseful Wheatley comprehends the choices he made, and what he might have done differently. Wishing he had, instead, helped Chell to escape rather than wind up in space. The game concludes, yet again, with a song sung by GLaDOS surmising the events of the game. The song, Want You Gone, written by Jonathan Coulton indicates that, despite claims that Caroline has been deleted, is still present inside GLaDOS, and that deleting Chell from her memory bank will make GLaDOS feel better. The song concludes with GLaDOS simply telling Chell she wants her gone. Development on Portal 2 begins shortly after Portal was released. It originally was planned to not include any portals in the game, utilizing a new mechanic called "F-STOP". Portal 2 was also planned to be set in Aperture Science's earlier days, specifically during the 1950's era. When asked one of the members that worked on Portal 2 that the game wasn't going to include portals, and how would the game be a sequel to Portal, and more specifically, use the Portal title. He replied with, "We'll deal with it later. ", hinting it was to focus on the game's mechanics first. Portal 2 was also conceptualized as set after the events of Portal, and GLaDOS would test the new subject, named Mel, similarly to how it was with Chell. After playtesters were disappointed after GLaDOS didn't recognize the player as the one who killed her in the first game, Mel was rejected as a result. Mel also appeared alongside Chell in the co-op mode of Portal 2 for a while before both being ultimately replaced by Atlas and P-body. There was also going to be a fourth Gel planned for the game. Also inspired by "Tag: The Power of Paint", the fourth Gel was named Adhesion Gel. Bearing a purple texture, it originally allowed Chell to walk up walls. It was canceled due to playtesters became too disoriented and often had motion sickness while trying to pass a Test Chamber with Adhesion Gel. The coding (although it does not have any texture and bestows no effects on the surface it was painted on), is left in the game files. The Potato Sack is the name of an alternate reality game (ARG) created by the Valve Corporation and the developers of thirteen independent video games to promote the release of Valve's title, Portal 2, in April 2011. Valve president Gabe Newell envisioned the game as a "Cross Game Design Event" in December 2010, and allowed the developers a free rein to design the game using Valve's Portal intellectual property. 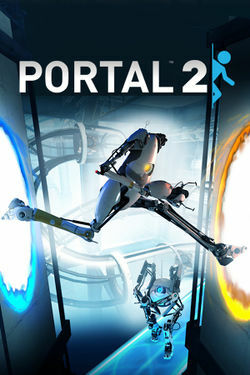 The game, requiring players to find and solve a number of puzzles hidden within updates of the thirteen games, ultimately led to the opportunity for players to release Portal 2 about 10 hours earlier than its planned release by playing games under the pretense of powering up GLaDOS, the sentient computer antagonist from Portal 2. The ARG's theme of potatoes is based on plot elements within Portal 2, specifically that for part of the game, GLaDOS's personality module is run off a potato battery. Large numbers of people participated in solving the puzzles within the ARG. Reaction from players and journalists was mixed; some saw the ARG as a show of strong support and commitment by Valve for independent game development, while others thought the ultimate conclusion was of limited benefit to justify buying the games to begin with. On the release date of the Potato Sack bundle, players found the games within it had recently received updates. Most provided an immediate cosmetic change by replacing or adding assets that referred to potatoes. When players started looking deeper into these new assets, they discovered a series of glyphs that referred to other games associated with specific letters, as well as nonsense sentences that lead to specific cyphers. Other hints were less direct, using online services such as Twitter and YouTube to embed clues. In the case of Toki Tori, sections of new levels included braille code that referred to latitude and longitude coordinates of Two Tribes' headquarters. One player, "Jake_R", traveled to Two Tribes, where he discovered the glyphs and cyphers posted outside their headquarters. Several of Two Tribes' developers, upon learning of his presence, began filming him from a barbershop across the street. They would later use this footage of him climbing a pole to find these clues as part of another clue during the second phase. The Portal 2 Sixense MotionPack DLC is an exclusive DLC available to owners of the Razer Hydra. The DLC includes specific levels and mechanics that make use of the Hydra's motion detection functionality. Peer Review is the first DLC released for Portal 2. Released on October 4th, 2011; this DLC introduces Challenge modes for both single-player and co-op, a leaderboards system, and a mini-hub area reserved for additional co-op tracks. This DLC adds the first of many additional courses to come with the introduction of the Art Therapy testing course. Perpetual Testing Initiative is a DLC released on May 8th, 2012; this DLC adds the anticipated in-game Puzzle Creator - fully integrated with the Steam Workshop, allowing the community to easily create, share, and play a wide range of Portal 2 puzzles. The DLC also adds the stick figure "Bendy" as a playable test subject, to avoid interfering with the storyline by having Chell test the community chambers. During a keynote presentation at the Games For Change festival in 2011, Valve director Gabe Newell mentioned that the company was beginning to work with schools to build curricula around Portal 2, looking into "how to teach attraction, repulsion... [they] need to be clear on what their metrics are... what the outcome is, what they're optimizing for". Shooting a portal to the moon as the ending was originally an easter egg "3 minutes into the game", which caused the player to be sucked out of the test chamber and die - and was an alternate game ending. The game was released at the same day as Narbacular Drop was. At the time this game was released, Narbacular Drop was 6 years old. Portal – the original game of the series. Portal: Still Alive – an exclusive Xbox Live Arcade version of the game containing the original content as Portal, as well as 14 new test chambers based upon Portal: The Flash Version, and new achievements. ↑ Kotaku: "Liveblogging Whatever Smart Stuff Gabe Newell Has to Say Today". This page was last modified on 11 March 2019, at 20:16.